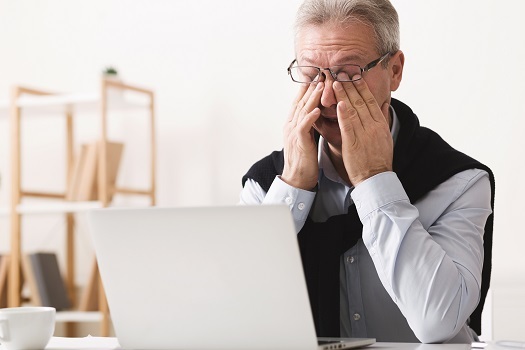 Stress is a constant concern among the senior population due to issues like decreasing health, a lack of independence, boredom, and a diminished social life. Chronic stress raises levels of cortisol, a hormone associated with elevated blood pressure, changes in metabolism, and increased blood sugar. These six senior health issues are often caused by stress. When seniors are stressed, they could end up with heightened levels of inflammation that have a direct effect on the delicate linings of the stomach and the intestines. Seniors may experience constant heartburn, constipation, or diarrhea due to stress. Eating a healthy diet can reduce the severity of these symptoms, but avoiding stressful situations can be even more helpful. Constantly being stressed can lead to higher blood pressure and cholesterol levels, so seniors who are stressed are more at risk for issues like heart attacks and strokes. Stress has such a big impact on the heart that sudden intense stress has been known to cause heart attacks instantly. Seniors who are at risk for heart conditions need to try to avoid stressful situations and learn better methods for managing stress. Stress is one of many components that can contribute to decreased mental and physical health in seniors. Not every senior has the same care needs, which means they don’t all need the same type of senior care. Toronto families can rely on Home Care Assistance to provide individualized care plans to meet your elderly loved one’s unique care needs. Our holistic Balanced Care Method was designed to help seniors focus on healthy lifestyle habits such as eating nutritious foods, exercising regularly, and maintaining strong social ties, and our Cognitive Therapeutics Method offers mentally stimulating activities that can stave off cognitive decline and delay the onset of dementia. Certain types of dementia, including vascular dementia and Alzheimer’s disease, are more likely to occur in people with a lot of stress, which happens because all the heart issues associated with stress can damage the brain or keep neurons from getting the nutrients and oxygen they need. Taking steps to manage stress through exercise and lifestyle changes may be helpful for reducing dementia risks and slowing the progression of the disease. Seniors who don’t manage their stress levels well could develop serious illnesses, making it a challenge to care for themselves on their own. If your senior loved one needs around-the-clock assistance at home, the Toronto live-in care professionals at Home Care Assistance are here to help. Our proprietary Balanced Care Method was designed to promote longevity by encouraging seniors to focus on healthy eating, regular exercise, mental engagement, and other important lifestyle factors. Chronic stress changes the way the body metabolizes carbs, fat, and protein, and it encourages the body to store more fat around the gut and midsection. Obesity can lead to poor health, but you can help by encouraging your loved one to exercise. Physical activity can fight off obesity, and it’s also an effective way of managing stress. Stress leads to increased glucose levels because the body is trying to generate energy in case it needs to face an attacker or flee a dangerous situation. Stress also indirectly causes problems because many people manage stress by eating comfort foods full of sugar or fats. Learning not to react to stress by eating can prevent seniors from increasing their risk of diabetes. Seniors already have a higher risk of depression than the rest of the population, and putting them through a lot of stress just worsens the issue. Because stress affects quality of life so severely, talk to your loved one about his or her stressors and find ways to address the issues. In cases of intense stress and depression, therapy can be quite useful. Stress can result in mental, emotional, and physical challenges for aging adults, but they don’t have to manage them alone. In Toronto, elder care agencies can be a great boon to seniors. With the help of the caregivers at Home Care Assistance, your aging loved one can lead a happier and healthier life. We offer a revolutionary program called the Balanced Care Method, which encourages seniors to eat nutritious foods, exercise and socialize regularly, and focus on other lifestyle factors that increase life expectancy. To hire a dedicated caregiver, call Home Care Assistance at (416) 488-8777 today.